To everyone's surprise, on 6 July 2005 when the International Olympic Committee's (IOC) decision was announced, London found it had won the bid to host the 2012 Olympic Games. It seems that we won because, although the 2004 Olympics in Athens cost nearly £9 billion, the British Government claimed that we could stage the Games in 2012 for a fraction of that, ie for a bargain-basement price of £2.4 billion. (The cost benefit analysis commissioned of Arup by the Government in 2002 which predicted that the cost of the Games would be even less - a mere £1.8 billion - has never been made public, despite Freedom of Information requests. 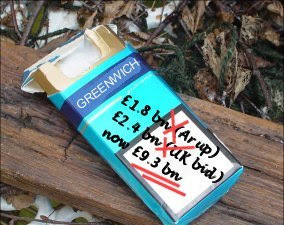 The executive summary of that report does not mention Greenwich at all.) Perhaps Cheapskate Britannia's bid had been a bluff, intended to "position" the UK well in the bid for the 2016 Games but not to win the competition to host the 2012 Games; if so, then the IOC called the bluff. This summer, only three years after we won the bid, and with four years to go, the budget for staging the Olympics is now £9.3 billion (more than Athens 2004), and a report by the National Audit Office (June 2008) has warned of significant cost over-run. There is still no fully costed plan, and the costs of security while constructing the venues, staging the event and transport have yet to be worked out. As to the costs and benefits of making Greenwich Park a venue for the Olympic equestrian events, we do now know, from a Freedom of Information request to the Department of Culture, Media and Sport (DCMS), that Greenwich Park was not selected on a cost-benefit analysis with alternative venues but on "a range of factors that LOCOG considered". These were: the "stunning backdrop" and the Park's location "close to the Olympic Park and Village". When is a corporate sponsor not a sponsor?